Skip the elevator, take the farthest parking spot, or stand-up frequently for an easy workout at work. Being active in one burst doesn’t help your overall health as much as you might think. Even if you go to the gym two or three times every week, prolonged sitting will still wreak havoc on your body. Your heart health is important – that’s why it’s a top priority to stay active and engaged throughout the day, in whatever ways you can. Even if you’re stuck at an office job there are plenty of ways to squeeze in a little workout at work or simply stretch while getting the job done. Follow along for simple ways you can change your work routine to give your body some love. Take the stairs – you’ve heard it before. But this advice sticks because it really works. 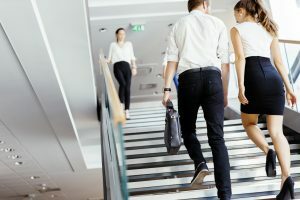 Walking up a couple flights of stairs before you work and making your way back down at the end of the day can have an incredible impact on your cardiovascular health and your lung capacity. One study found that if an office worker took the stairs every day (for a total of about 6 minutes of “stair climbing”) over 8 weeks they would increase the amount of oxygen they could use during rigorous exercise at a rate comparable with what they could if they had gone for a walk for 45 minutes per day. Now that’s an improvement! If your office complex has a large parking lot or garage, chances are you spend a few minutes per day driving in circles looking for the closest possible spot to the elevator. Instead, fit in a quick workout at work by taking the spot farthest away – either right when you enter or all the way at the back. You’ll be less stressed – after all, avoiding that daily fiasco is a reward in itself. But fitting in all those extra steps, you’ll also shed calories and make your heart happy. Many studies have found that regular walking boasts the same degree of positive health benefits of regular running. For those of us who can’t stand running, the easy solution is just to park farther away. One simple adjustment that can really benefit your overall health is to ditch the habit of sitting entirely. After all, sedentary time is what leads to heart disease, high blood pressure, and obesity. Take charge and fight the health problems with sitting down by simply refusing to sit down in the first place. 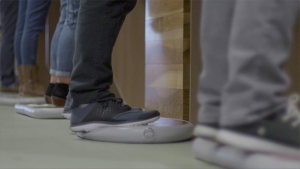 But switching to a standing desk often isn’t enough. It’s imperative to maintain proper posture, and workers who aren’t used to standing for hours may feel backache and strain. Use a Wurf board at work to alleviate these problems. The constant movement on the board ensures you aren’t sedentary, and every muscle group in your body is engaged so you naturally relax. 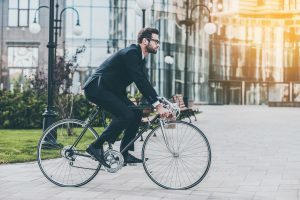 If you live within a few miles of your office, one terrific change you can make is to ride your bike to work. The health benefits are obvious, and exhaustive. There are few better ways to stay in shape than to ride your bike! On top of that, riding your bike will save you tons of money that you would have spent on gasoline, and it greatly benefits the environment. If you make one (or all) of these changes you’ll start to feel the difference right away. Incorporating your work out into your work routine can be tiring at first, but stick with it and your body will feel better than ever!